This concert will feature the six pieces created by our Emerging Composer Workshop participants, written for singer, simple percussion and ensemble. Soundstreams’ Emerging Composer Workshop (ECW) is an annual, 10-day intensive mentorship program that supports talented young composers in launching their careers. 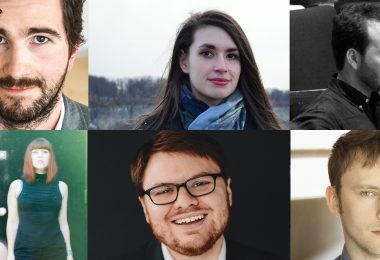 Six talented young composers will converge on Toronto for this unique mentorship opportunity. The ECW workshop hosts both an international and Canadian composer mentors, as well as a professional resident ensemble who collaborate with the young composer on a work. This year’s mentors are Pulitzer Prize-winning composer David Lang, and Jules Léger award winner James Rolfe to lead the workshop. This concert will feature the six pieces created by our Emerging Composer Workshop participants, written for, singer, simple percussion and ensemble. Soundstreams’ Emerging Composer Workshop Showcase is presented in honour of Jim Doherty, and his timeless dedication to investing in young talent.